For some reason, lost on me, I’ve been seeing the ad below on web sites everywhere. There are several intriguing aspects to this ad. “From Japan.” The mysterious “”ALEXCIOUS” tagline. There is a gentleman in a lab coat who appears to be a musical ninja. ALEXCIOUS is a site devoted to vending items from Japan. “Discover the Beauty of Japan” As an admirer of Japan, I appreciate their raison d’etre. The Otamatone is a musical instrument, shaped like a musical note with a smiling face. For vibrato, squeeze the cheeks. 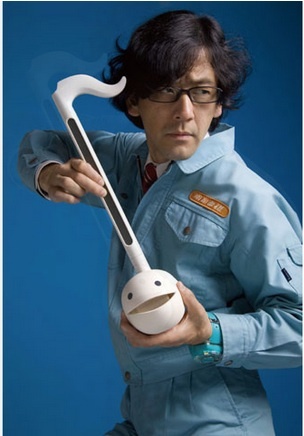 The Otamatone Deluxe costs ¥6,980 JPY or $86.